Vast Public Indifference: Happy Patriots' Day! One of the most noted markers for the British soldiers is the one right beside the North Bridge where the first of them were killed. Here's an online photo I found, with James Russell Lowell's verse. I understand there is a volunteer organization that keeps overseas British military graves decorated -- I've forgotten the name, but perhaps someone knows. This one always carries a British flag (whenever I've been there), as does the tiny marker next to the sidewalk near Concord center that records another British burial. 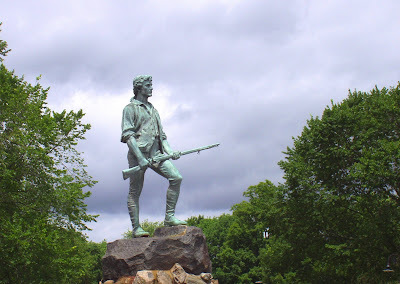 And here's the story of the Minuteman, as I wrote it up for some students several years ago.